Oh, that yellow spandex with beautiful blue trunks. As classic as that suit was, I have no beef with Wolverine's badassery tossing that away in the movies (plus, with a body like Hugh Jackman's...). But still, it's nice to see the Wolverine we all loved as a child again. 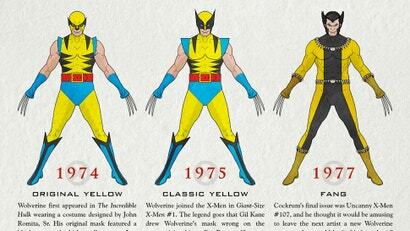 Here's the full history of all the suits that Wolverine has ever worn. It's funny to see all the different variations of Wolverine. The first Wolverine actually looked wolverine-ish but didn't look nearly as intimidating as the bat-like ears that were added to Wolverine's mask. Later Wolverines added much more body hair, different colours and changes due to storyline. Eventually, we see how the movie version came to be. It's all a wonderful trip down memory lane.